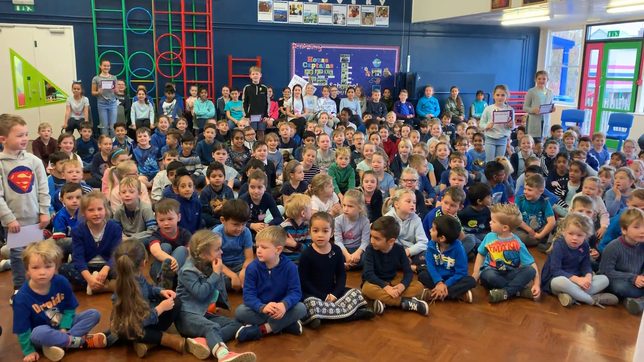 Well done to our Headteacher Award winners this week (12 April 2019). Congratulations: George, Rose, Jessica, Archie, Corey, Amelia and Emanuella. The Courtesy Award goes to James Maloney. Well done to our Headteacher Award winners this week (29 March 2019). Congratulations: Charlie, Molly-Anne, Amber, Jessica, Evie, Nathan and Luke. The Courtesy Award goes to Oscar Jorgensen. 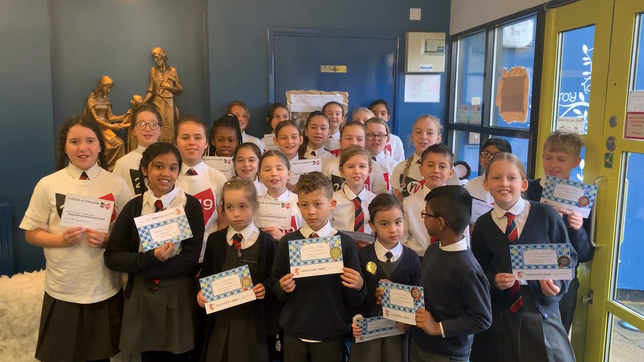 Well done to our Headteacher Award winners this week (22 March 2019). Congratulations: Hayden, Samvir, Daniel, Harriet, Kajetan, Caitlyn and Danny. The Courtesy Award goes to Joshua Foster. Well done to our Headteacher Award winners this week (15 March 2019). They have another important message #planetprotectors "GET RID OF ALL THE PLASTIC!" Congratulations: Sofia, Corey, Jane, Jamie, Abigail, Eve and Marc. The Courtesy Award goes to Olivia Jeffs-Watts. 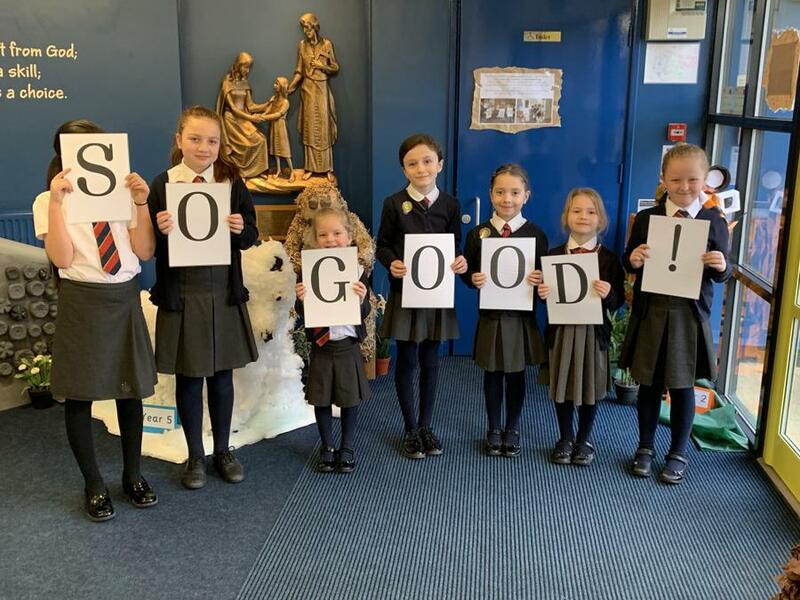 Well done to our Headteacher Award winners this week (8 March 2019) who are very GRATEFUL for all the gifts they have already received from God as the season of Lent begins. Congratulations: Ben, Ty-Daniel, Lacey, Shaun, Rayan and Maks. The Courtesy Award goes to Denver Cooke. Well done to our Headteacher Award winners this week (1 March 2019). 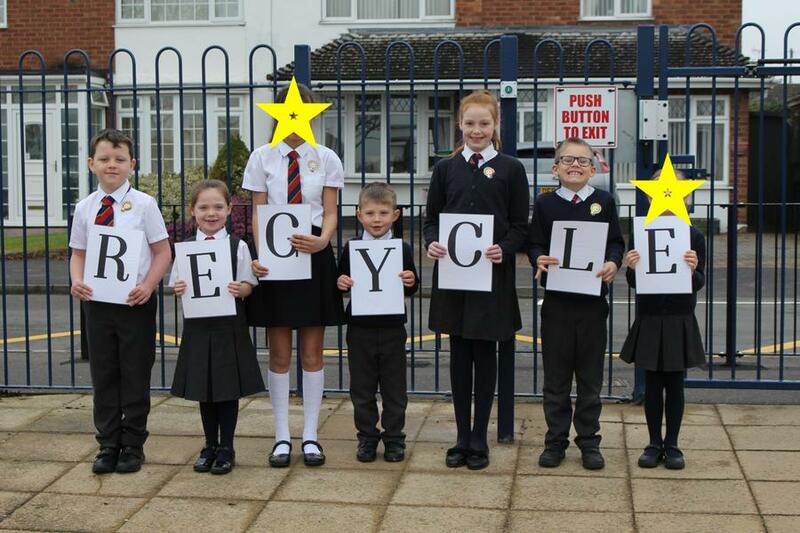 Congratulations: Alfie, Maisie-Lou, Aysha, Charlie, Megan, Sofia and Oliver. The Courtesy Award goes to Oliver Ptak. Well done to our Headteacher Award winners this week (8 February 2019). Congratulations: Ava, Kirsten, Orla, Sophie, Annie-Rae, Mariella and Pollyanna. The Courtesy Award goes to Pietra Tessman. Serenaded by the Young Voices choir...Well done to our Headteacher Award winners this week (25 January 2019). Congratulations: Paven, William, Marley, Olivia, Bella, Aarav and Kim-Anne. The Courtesy Award goes to Manveer Bains. We're so excited...only 18 sleeps to go! Well done to our Headteacher Award winners this week (7 December 2018). 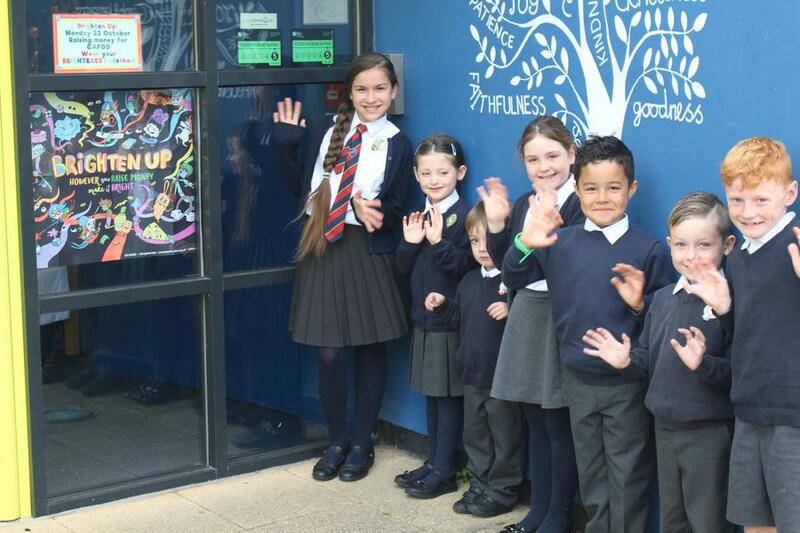 Congratulations: Jayden, Marco, Karter, Orla, Ben, Hanna and Pietra. The Courtesy Award goes to Rocco Zanchi. Well done to this week's (30 November) Headteacher Award winners: Manveer, Thomas, Alexander, Joshua, Caelen, Noah, Rhys and Ryan. 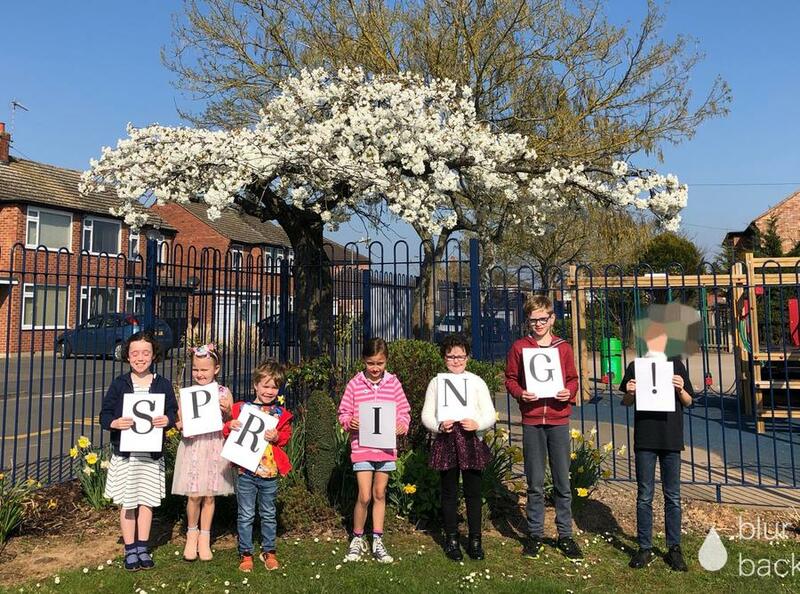 They have a special message about this wonderful time of year. They are also keen for you to notice the toy appeal which we are supporting. The Courtesy Award goes to: Josephine Cooke. Congratulations: Cobi, Kian, Ananda, Lana, Lily, Eden and Casey. The Courtesy Award goes to Kaitlyn Jamison. 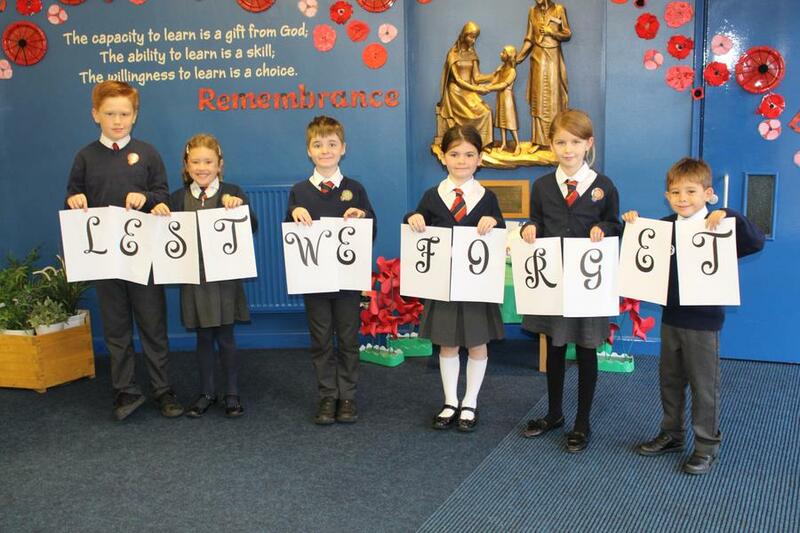 Remembrance message from our Headteacher Award winners this week (9 November 2018). 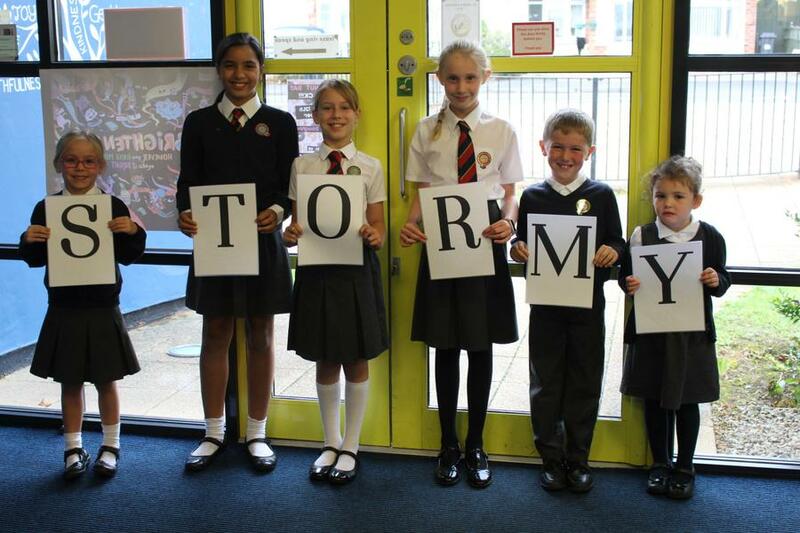 Congratulations: Koen, Milo, Denny (who helped to take the photo), Jake, Isla, Amelie and Phoebe. The Courtesy Award goes to George Kavanagh-Clarke. Indoor photo this week - it's too STORMY outside! Congratulations: Emma, Isabella, Melissa, Mary, Jack and Ella. The Courtesy Award goes to Caitlin Borley. 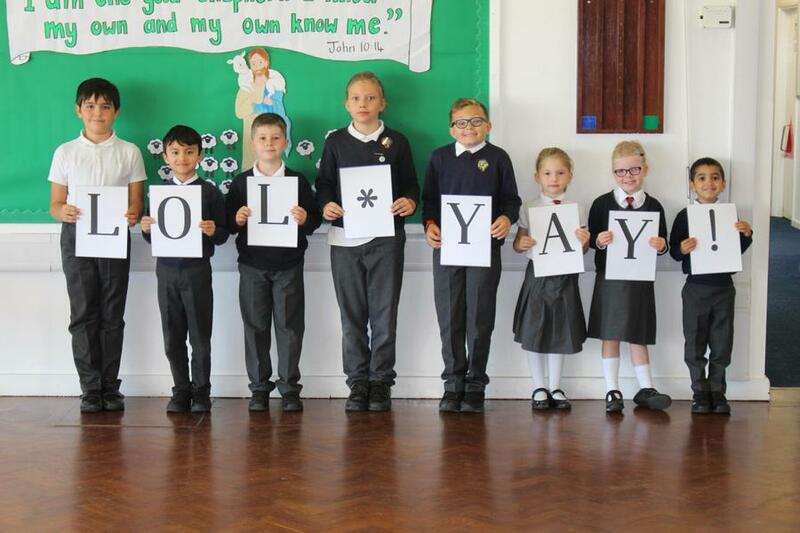 Jazz hands from our Headteacher Award winners this week (5 October 2018) as a reminder to all about the 'Brighten up your day' non-uniform day for CAFOD this harvest. Congratulations: Jacob, Finley, Isla, Kai, Macey, Oscar and Angelina. The Courtesy Award goes to Dhanveer Bains. 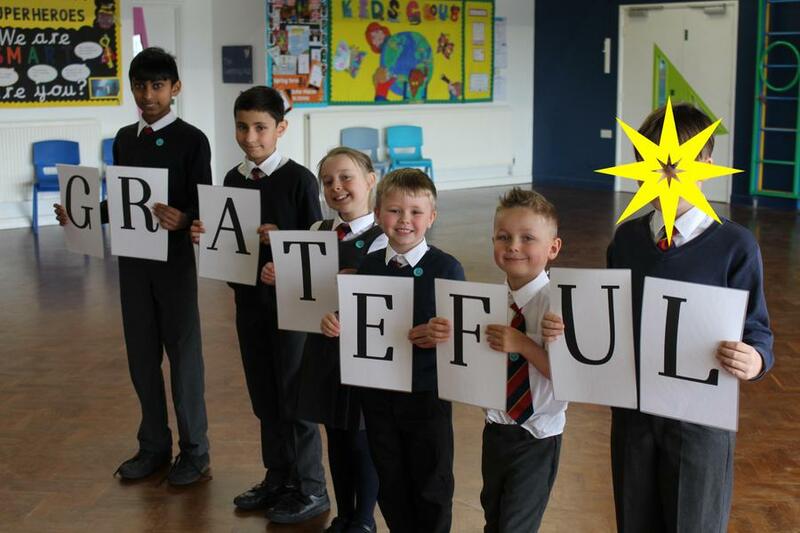 YAY and LOL for our Headteacher Award winners this week (28 September 2018). 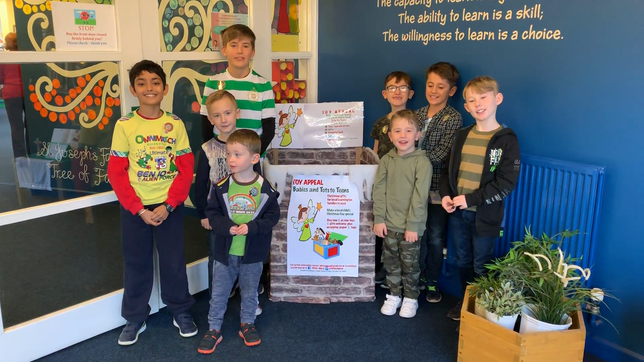 Congratulations: Matteo, Mariella, Aarmaan, Marley, Vincent, Reece, Joe and Hugo. The Courtesy Award goes to Dhanveer Bains and Susie Swan. 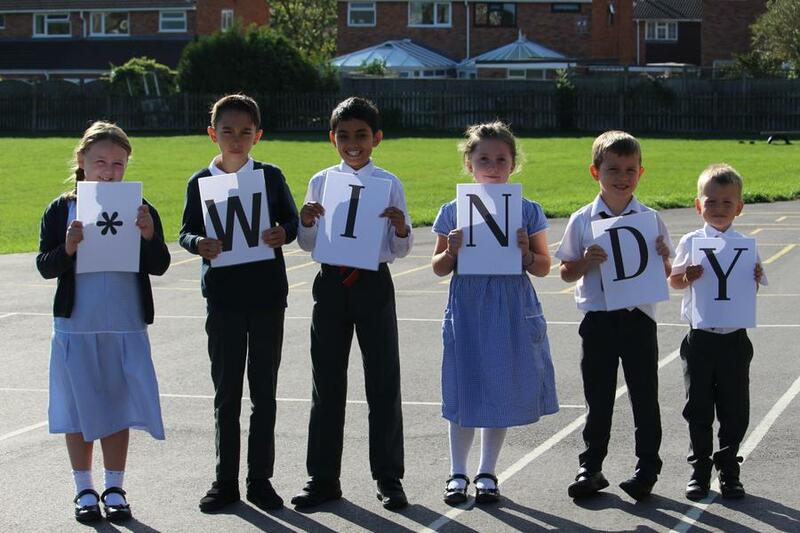 Our Headteacher Award winners this week (21 September 2018) were rather blown away! Congratulations: George, Jack, Jayden, Nicole, Anya and Manveer. The Courtesy Award goes to Molly Connolly-Meade. 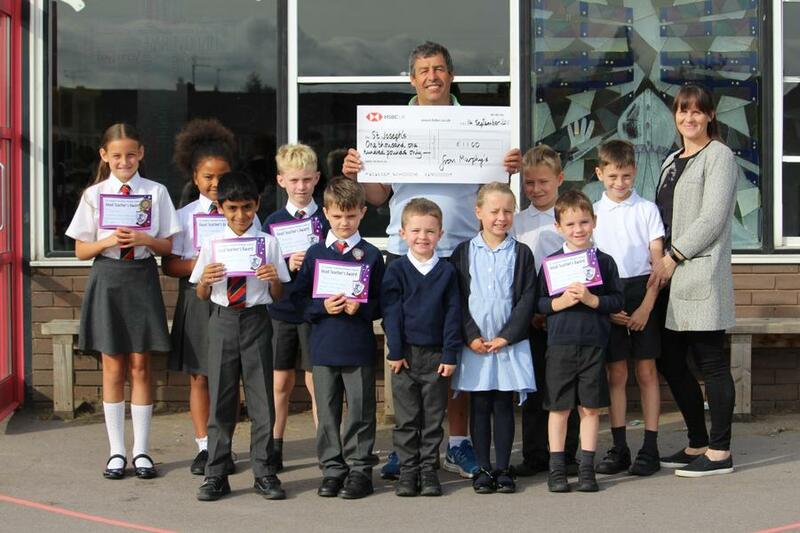 Our first Headteacher Award winners (Friday 14 September) are holding a rather lovely cheque for us! Thank you so much to Kev Murphy and his fundraising generosity. We are truly blessed. Congratulations to: Alexi, Harry, Denver, Sam, Mia and Arjun. The Courtesy Award goes to Joseph Deeley-Tham.